You guys--this release is so fun! I am not normally in to Halloween products, but these stamps sets are SO STINKIN' CUTE AND FUN! So let's get right to the cards! For this first one, I stamped the most detailed layer of the Rose Garden stamp set images on to watercolor paper with various CP inks. I then used a water brush to spread out the inks to create a loose watercolor look. To create some added depth and variation, I then stamped over the image with white pigment ink, which caused the detailed lines to blend in even more, but still to an extent that they were contrasted. Here's my advice for doing your own thing on watercoloring: Don't give up! After you've finished painting the flowers, cut them out and I promise it will already look 100 times more like a flower! So cut out all the flower images and then set them aside. Then create your background! I used a CP stencil and the new Sandcastle ink to create the background. I cut it down to a 4.25 x 5.5 inch card panel and then glued it on to a cut and scored 4.25 x 5.5 inch card base. I then trimmed down some scrap pieces of patterned paper I had in my stash and glued them on to the card base. I then glued my roses on to the card, stamped a sentiment on to white cardstock, and then cut down the sentiment piece before gluing it on to my card to finish things off. Here's another tip: To add some variation and dimension to your card, choose different elements to mount with foam tape, while choosing others to lay flat on to the card. For our second card, I broke out some of the dies from the Everything But the Broom set and went to work! I cut out several pieces and covered them with black ink, then set them aside. To create the simple background, just use various CP inks and a flat paintbrush and paint stripes on a watercolor panel. I cut down the panel and glued it on to a cut and scored 4.25 x 5.5 inch card base. I glued down the die cut pieces to the card and then stamped a sentiment. I cut it down and glued it down flat on the panel. I added some details to the die cut pieces with a white gel pen, but....HAVE YOU FIGURED IT OUT YET?! These pieces are arranged to make this image look like an actual witch. I added some images from the set to fill in the background and finished it off. Folks, this is not how I usually do card making, so this design idea was totally and completely outside the box. But so worth it! Thanks for enjoying these cards today, and here are the details of the hop cause you have some chances to win PRIZES! Hop along to each blog for a chance to win a $25 gift certificate to the Catherine Pooler shop! A winner will be chosen from each day of the hop and all winners will be announced on Monday evening, August 20. Very pretty and quite creative. I love your halloween card! What a great idea! Love the detail on both your cards. Need to work on that for mine. I love the witch card!! I got it right away and think it's cute and genius! Both cards are awesome. 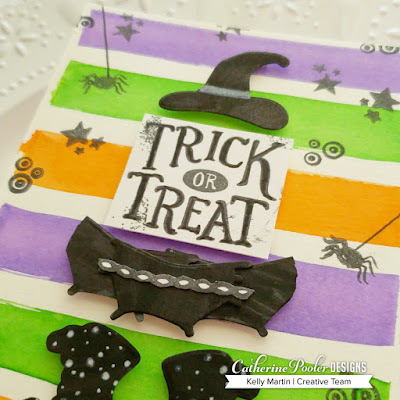 Pretty flowers and a fun Halloween card! 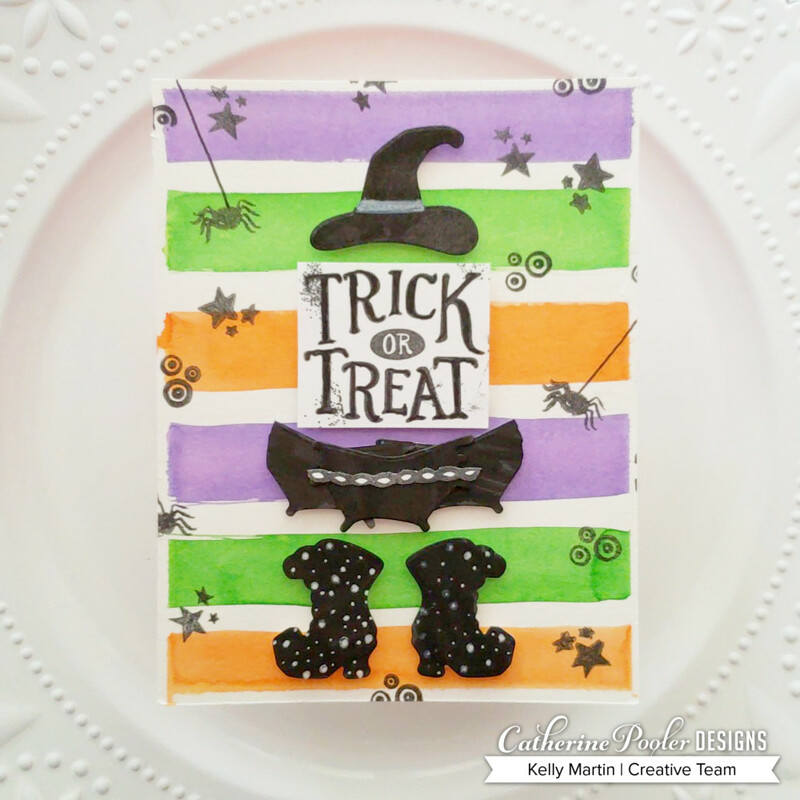 Beautiful floral card and a very cute Halloween card! Really great examples of how to experiment and expand the use of your stamps. Like the soft look of the watercolored roses. Super cards and I love the narrow central panel of the floral card. So elegant. I like the way you made your flowers so soft. Great idea to add white pigment ink. The Halloween card is so cute! Fun looking witch card... Very creative. 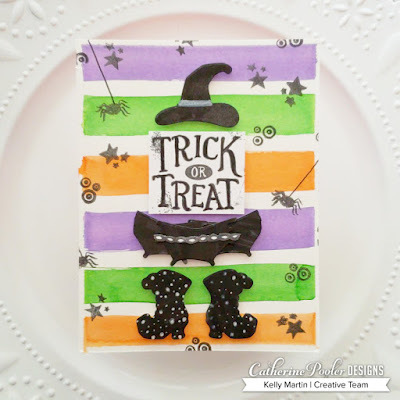 Love your "outside the box" Trick or Treat card. Beautiful and fun cards! Love the technique you used to add a watercolored look to the flowers. I like the watercolors Rose's. Who doesn't love a Halloween card? Great cards and explanation. Appreciated! Interesting use of color in the witch card instead of traditional orange and black. Your tips on watercoloring were very helpful. Your water colored flowers look gorgeous. Your witch is so cute and such a clever idea. Great cards. 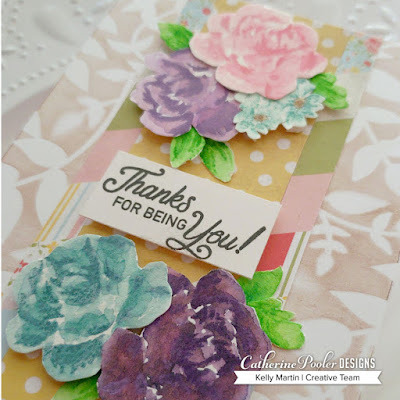 I just love the flowers card;it gave me some ides to spring off of it. Thanks for sharing your cards. The "Thanks for Being You" card is lovely, and the Hallowe'en card is lots of fun! Such beautiful and fun cards. Love the Halloween and lovely flowers. These are great Kelly! The first one is so elegant and the Halloween one is so fun. Love the loose watercolour look with the layering stamps. I will have to tr6 that. Oopps wrong spot!!!! Sorry Kelly. I loved your roses the are very beautiful and life like. Your halloween card is very cute. From elegant to super fun. Both of these cards are great. Great cards - totally different style! Beautiful cards! from super fun to soft and elegant. Thanks for sharing and being apart of this wonderful release.